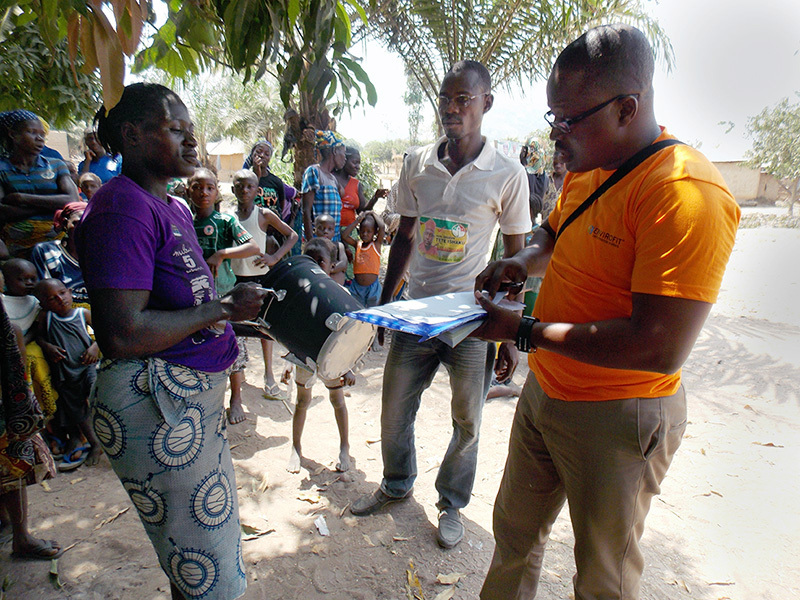 Envirofit has been working in Nigeria since 2012 and to date has reached over 250,000 people by manufacturing, distributing and selling the country’s highest performing line of cookstoves. We spoke with our Country Director, Biodun Olaore, about the challenges and successes of the last 5 years and how Envirofit Nigeria has improved the lives of their employees and customers. 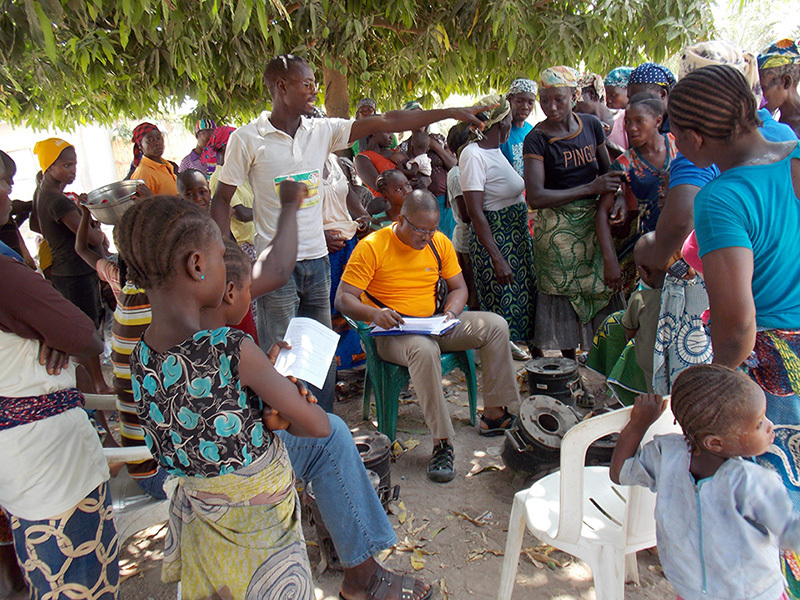 Biodun (in orange) talks about the benefits of owning an Envirofit cookstove with a customer in Rije, Abuja. Nigeria is Africa’s most populous country, home to 186 million people. The Global Alliance for Clean Cookstoves estimates that 75% of the nation still uses biomass fuels such as wood and charcoal to cook. Given their large population and high percentage of biomass users, it should come as no surprise that the country was also named the world leader in deforestation in 2005 by the Food and Agriculture Organization of the United Nations (FAO). With an annual deforestation rate of 3.5% and a population that is expected to reach 400 million by 2050, there is a strong need for cooking solutions that lessen their dependency on their rapidly shrinking forests. Envirofit’s flagship line of SuperSaver wood and charcoal stoves are well suited to meet this need, reducing fuel usage up to 66% compared to traditional cooking. Envirofit’s production facilities in Lagos, the country’s largest city, were recently upgraded and are now capable of producing 25,000 stoves per month. As national stability improves, Envirofit is well positioned to grow along with demand. Leading our efforts in Nigeria is Country Director, Biodun Olaore, who has been with Envirofit for 3.5 years. Having formerly worked in the solar household lighting sector before moving into cookstoves, Biodun has an excellent understanding of Nigeria’s household energy needs. With his team working alongside him, Biodun has taken to the challenge of meeting Nigeria’s diverse energy needs. In a country double the area of the US state of California, Nigeria is home to many different cooking traditions. In the North-west, Abuja, and the southwest people use mostly charcoal stoves stove. Contrastingly, southeast and southern Nigerians cook mainly on wood. Despite these differences, Biodun remains confident that Envirofit cookstoves are the right choice to improve the lives of all Nigerian households. “Our stoves have to show every household that they save heavily on fuel consumption for cooking,” Biodun said. But practicality alone isn’t the sole motivating factor. Envirofit cookstoves are manufactured in Nigeria, and this has helped create jobs, provide professional development opportunities, and sales training and mentorship, which is important in a country with a 14% unemployment rate. This passion for guiding young people has been a hallmark of Biodun’s career. He is the President and Co-Founder of Save A Child, Save A Nation Foundation (SACSAN), a social enterprise that nurtures and develops future leaders while they are still young and impressionable. He has also volunteered to teach business and economic education in various schools throughout the region, further sharing his strong passion for developing people, leadership and mentoring. When he isn’t out representing Envirofit as the Sales Director, he also cooks on our stoves and swears by their durability and ease of use. As elsewhere in Western Africa, Nigerians use charcoal and wood to make dishes that take longer to cook, such as traditional staples like fufu, a thick, starchy dough made from cassava and plantains that must be boiled and kneaded to soften it before it’s served. These traditional dishes are a celebrated part of Nigerian cuisine. Helping families cook more efficiently has made Envirofit stoves a welcome addition to kitchens throughout the country. For his part, Biodun enjoys rice & beans, bokoto (spicy cow’s leg), and fufu on his Envirofit stove. As Envirofit Nigeria looks forward to their next 5 years, Biodun is excited about the challenges and opportunities ahead, and the chance to reach even more families with durable, affordable improved cookstoves.